And we've arrived at the end of this leg of the journey, watching nothing but Royal Themed holiday Christmas movies, with 'A Prince for Christmas', but there are a couple of glaring omissions that unfortunately holds it down. Emma (Viva Bianca) is a diner owner / operator in some cold, snowy northeastern town, but despite the love of her baby sister Alice (Brittany Beery), Emma is always sad. Her parents died a few years back returning from buying a Christmas Tree, thus she's not too fond of Christmas and hates trees in particular, Her boyfriend Todd the used car salesman (Aaron O'Connell) is a bit of a jerk and she's dumped him, though Todd refuses to accept this, and is she sick of working in a diner and wants to see the world. Halfway around the world in the small country of Balemont, I think, resides prince Duncan (Kirk Barker). In seven days time he is slated to be married to some woman he barely knows, but he wants true love, just like his mother Queen Ariana (Kelly LeBrock) and his father King Jasper (Maxwell Caulfield) have. The queen isn't hearing any of this of course, so in the dead of the night, with the blessing of his man servant and confidant Geoffrey (Mark Lindsay Chapman), Duncan jumps in the Bentley, which I observed was a left hand drive Bentley, and hops on a plane to America to experience life for a change. As dumb luck would have it, Duncan gets stranded in Emma's small town, but it's not so bad because love has hit these two fast and hard. Maybe Duncan should tell Emma that he's a European prince slated to be married in a few days... but hey, that's crazy talk. Do you know who happens to have this critical information? Todd does, that's who. And Todd's a tattletale hater. Well now there is no love to be had for those two, because if anybody ever overreacted to anything, it was Emma reacting to the news that this dude was a prince, but the effect that the Prince had on the diner owner, and vice versa was powerful. They call that power love where I come from, and love will not be denied. As per usual. These Carolers, who were singing to no one, while only facing an empty city street and snow drifts. Now this right here is an old school move. Girl playing pool, dude nuzzles up behind her to show her how to properly hold the stick, no matter how good she might be... Don't think I've ever seen this move done in reverse. Well here you go. Smooth move sister. I guess. Kind of weird actually when you think about it. This Chick. The woman circled is our Royal preferred Duchess or Baroness or whatever who is usually very critical in these movies, but take a good look because that's ALL we're gonna get to see of that woman. I'm not even sure that's a real person. This mf'n scene... So my man Max (Peter Johnson) ain't so good at that book learnin' so Prince Duncan is helping him study for a culinary entrance exam... at a bar, while downing brews. It is not my place to tell these people how to study, but it's been my experience that a quiet place, like a library maybe, with the minimum of alcohol, always helps the retention of information. It didn't help the study session that a bar fight broke out a few minutes later. Want to know what I'm NOT going to be able to show you? Our star, our future princess, in a ballroom gown. What is up with that? Who dropped the ball? Viva Bianca is very tall, very thin, her walk is more of a glide than a gait.. I mean she's basically a walking, talking fashion mannequin. No need to fit her for a gown since anything off the rack will do as almost all dresses are all made for people who look just like her. It's an outrage. Now that oversight aside, and it is a glaring one, this one is near the top of the list of these Royal movies we've seen, if only because of the cast. That's really the only thing that changes in these things. In fact, the cast in this one almost seemed to good for the material. Our principles in this movie were delivering their lines with a seriousness and a passion reserved for... well.. regular movies, except for Kelly LeBrock, but then she gets a 'Weird Science' pass for life and thus she is, and always will be, beyond criticism. Viva and Kirk, however, did not get the memo that this was a disposable holiday romance movie and bought their A+ games. When a severely distraught Emma tells Duncan "Two men in my life and the honest one is a used car salesman" I believed that line. In the end when it is time for our heroes to declare their love and the self-defeating Emma whines with "You can do better than me." and Duncan turns around with "Not if I searched a thousand summer gardens, the rose I choose fouls only fouls in the snow"... Now I'm not completely sure what that means, but normally hearing something like that, in something like this, would make me throw up in my mouth. Repeatedly. But with Kirk Barker saying it, I was like "Awww..." And don't get me started on Mark Lindsay Chapman's awesome Super Spy take on a butler. When we do our End of the Royals awards ceremony, this is one walking away with some hardware. Except Best Gown. Not getting that. The Vomit worthiness was fair to middling. Lots of snow, lots of Christmas ornaments, no cute kids, just a cute teenager which doesn't count, we had carolers singing to no one in particular, made up Christmas songs and recognizable background Christmas music, all of which is very vomit worthy. Obviously Emma's hatred of Christmas trees is not very Christmassy, nor are bar fights or beer infused study sessions for that matter. 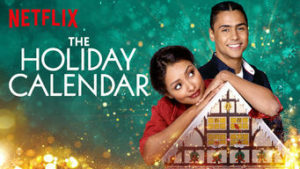 But if you are a lover of these movies and you are looking for one that takes itself a little more seriously than the rest, 'A Prince for Christmas' could be the one you've been searching for. Minus a Ballroom Gown. What's up with that?